This screen determiner is a necessary tool for anyone who works with half-tones. Each line in the grid is a wedge line. The instant that it is laid onto a half-tone, it forms a star that determines the screen count. No matching! This item is available for imprinting - contact us for details and pricing. The price of the 719 is $3.95. 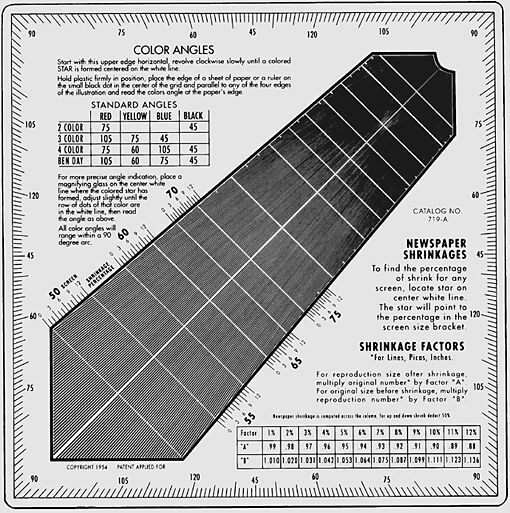 This screen determiner is a more advanced version of the 719 and is designed for color work. The front is just like the 719 but the back, pictured here below, is used to determine the angle of each color. The small dot in the center of the protractor determines the angle of each color as the color stars form when the grid is rotated to bring them in. Amazing how it clearly separates each color except the yellow. This item is also available for imprinting. The price of the 719A is $4.25. 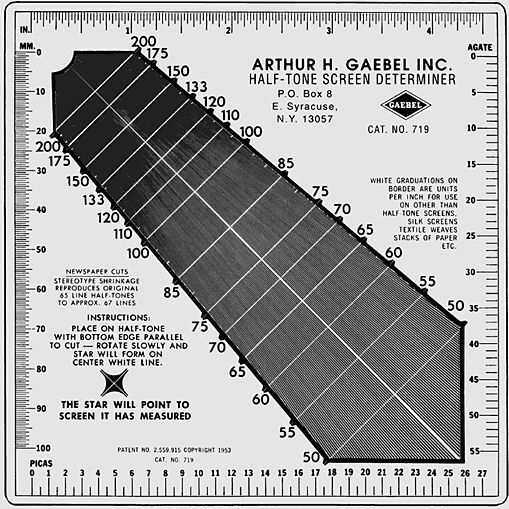 This great tool is a screen determiner and a color density chart together. It measures screens form 50 lpi up to 200 lpi and densities in 10% increments from 10% to 90%. It also has a handy pica scale and an inch scale in 16ths. Measures 3" x 9 3/4". The price of the SFG-1 is $4.75.